Recently i contacted you about a protocol for treating ear pressure when flying. You asked me to let you know how I did. I took two Sinus support and two sprays of Tei Fu in silver in each nostril the night before I flew, when I got up the morning of the flight, when I arrived at the airport (around noon) and half way through my flight. I also chewed gum for the entire flight. The departing flight I landed into a high pressure center and had no ear problem. I did the same procedure when i returned home. The return flight landed in a low pressure center which is when I have had problems in the past. I had a bit of pressure during the descent. Chewing harder on the gum helped that. I did not have the severe pain I have experienced in the past. My ears were a bit plugged up for the rest of the evening but cleared by morning. Thank you so much for your help. It made my trip so much more pleasant. Many of my clients have had exciting results from using natural methods. This area is a place where they can tell their story. Their results may not be your results because everyone is individual and there are no two people exactly alike. It is best to work with a person who understands how the body systems work and can advise you along the way. While I was practicing my Aikido moves, I fell the wrong way (I have a video below to show you my son flipping his teacher and how she falls the correct way). I heard a crunch and felt sharp pain. 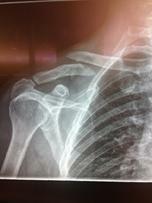 I thought it was my shoulder but you can see in the xray picture that it was my collar bone. This happened on the fifth of September 2014. They put my arm in a sling, gave me a prescription for pain killers and told my I should schedule surgery to have titanium screws put in for it to heal properly. I called my Mom and Dad (Naturopath and Chiropractor) to get advice. They both concurred I should have the surgery. So, you can see the xray of the procedure. Prior to having the procedure my mom told me I should take Liquid Chlorophyll to help reduce inflammation. I was on a health regimen with Nutri Calm, AnxiousLess, Omega 3, Astragalus and a few other supplements like Thai Go so my body had some good nutrition to start healing. The inflammation went down enough for them to do the surgery on the 11th. I was able to get off of the Oxycontin rather quickly (we think because of the AnxiousLess and Silver mainly). You can see the thin line where my scar is and no redness. This picture was taken on the 26th (just 21 days later!) The nurse commented, “wow, you’re a good healer!”. The main things I took were: Silver Shield –1 Tablespoon three times a day; topically applied the gel. Liquid Chlorophyll 1 tablespoon in 4 ounces of water and 6-8 Bone Skin Poultice capsules daily. I also wore a sling to minimize the movement. I’m continuing this regimen until there is no more pain but I’m glad I was able to act quickly with the nutrition so that my body could heal this fast. If you would like your story to be posted, please email me what you want said and include jpeg pictures of what you would like to show people about your healing experience. Thank you for sharing.